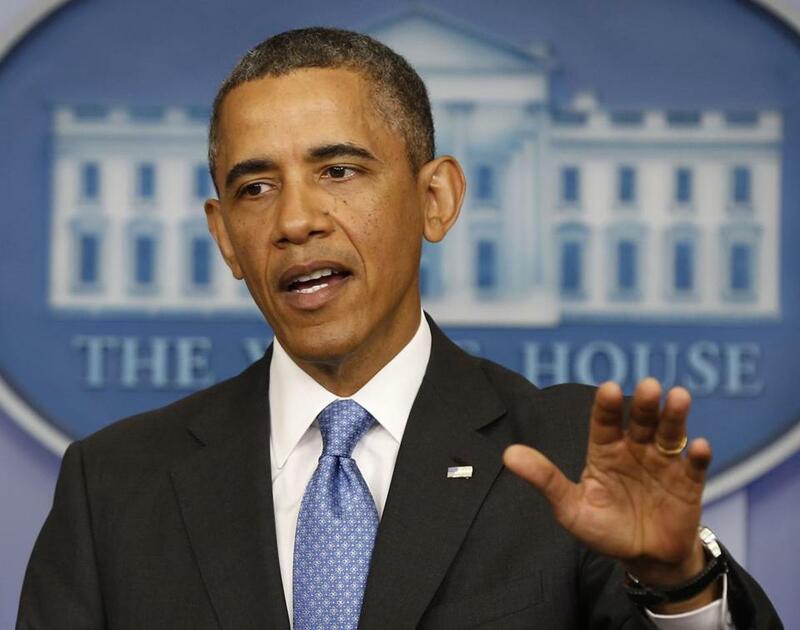 President Obama talked during a press conference at the White House on Tuesday. WASHINGTON — President Obama on Tuesday defended the FBI’s handling of Russian intelligence tips on one of the alleged Boston Marathon bombers, even as he endorsed an investigation into the lessons to be learned from the case, including ways to better confront the threat of homegrown terrorists. While much of the focus from law enforcement officials has been on examining whether suspect Tamerlan Tsarnaev was radicalized during a six-month trip to Dagestan in 2012, Obama has asked counterterrorism advisers to look at ways to thwart people who may become radicalized in America. Obama said that for “months’’ before the April 15 bombings, he had been asking his counterterrorism team what more could be done to identify and prevent such a domestic threat. He appeared to suggest a solution might be closer cooperation with organizations on American soil, while also acknowledging the potential for civil-liberties concerns. Tamerlan Tsarnaev was an ethnic Chechen living in Cambridge, who Russian authorities in 2011 warned was becoming increasingly radical. The warnings, which also raised red flags about his mother, were delivered separately to the FBI and CIA. The FBI investigated and interviewed Tsarnaev in 2011 and found that he did not pose a threat at that time. Obama was reacting to a reporter’s question about a Globe report Monday night that Obama’s director of national intelligence, James R. Clapper, has requested an investigation to determine “lessons learned’’ from the case. The independent review will be conducted by the Intelligence Community inspector general. “Is there something that happened that triggered radicalization and an actual decision by the brother to engage in the tragic attack we actually saw in Boston, and are there additional things that could have been done in the interim that might have prevented it?’’ Obama said. A spokesman for Clapper said that even while he was calling on agencies to comply with the review, he did not believe they did anything wrong. Since two bombs exploded near the Boston Marathon finish line on April 15, killing three people and injuring more than 260, law enforcement and intelligence officials have been on two tracks: trying to figure out exactly what happened, and how to prevent something similar from happening again. Tamerlan Tsarnaev died after a confrontation with police on April 19. His younger brother, Dzhokhar, also a suspect, was captured in Watertown on the evening of April 19. The president said Tuesday that Russia has been cooperative in providing information about Tamerlan Tsarnaev’s travels to Russia in 2012 and its warnings in 2011 to the FBI and the CIA. He noted that he and President Vladimir Putin had spoken about the need for shared information. But he also alluded to decades of distrust between the countries. Some specialists have said a focus of the new intelligence investigation must be how much the FBI told officials in Massachusetts about the Tsarnaev family beginning in 2011. The Globe reported last week that the Boston Regional Intelligence Center and the Commonwealth Fusion Center in Maynard, which are supposed to serve as clearinghouses for information about potential terrorist threats, were unaware that the FBI interviewed Tsarnaev as part of a three-month investigation. The FBI has said watchlist information and investigative records about Tsarnaev were available to local officials through Boston’s Joint Terrorism Task Force, which is made up of representatives from local, state, and federal agencies. General Martin Dempsey, the chairman of the Joint Chiefs of Staff, told reporters he sees two potentially significant lessons from the bombings. If it turns out that the older Tsarnaev had links to Chechen terrorist groups or operatives, he said, US officials will have to pay more attention not only to Chechnya but to other hotbeds of Islamic terrorists that have not been traditionally viewed as threats to US soil. But even if that is the case, it means officials must look more closely at the self-radicalization process at home, Dempsey said. Officials have said the Tsarnaev brothers may have downloaded bomb-making instructions from the Internet, and Tamerlan Tsarnaev maintained a YouTube account featuring radical Islamic videos. Some terrorism specialists have already begun to rethink their views of the significance of the homegrown threat after the April 15 attacks. “It is a case like this that brings home that radicalization takes place within American communities,” said Robin Simcox, a London-based researcher for the Henry Jackson Society, an international affairs think-tank based in London. Meanwhile, the top Democrat and Republican on the Senate Homeland Security and Government Affairs Committee vowed Tuesday to hold oversight hearings. They said a critical issue is whether federal and local agencies properly shared and followed up on information before the attack. Obama also lauded the response by Boston residents in the face of the shocking bombings at a cherished event. “Everybody can take a cue from Boston,’’ he said. “You don’t get a sense that anybody is intimidated when they go to Fenway Park a couple days after the bombing. There are joggers right now, I guarantee you, all throughout Boston and Cambridge and Watertown. Matt Viser can be reached at maviser@globe.com. Bryan Bender can be reached at bender@globe.com.